"QOF" stands for, Quad leg, Oblong master link & Foundry hooks with large throat openings. 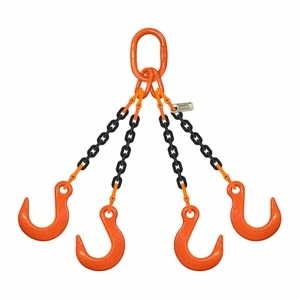 These Grade 100 chain slings feature an oblong master link on one end and four open-style foundry hooks on the other end. 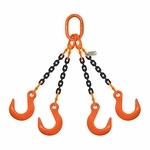 Foundry hooks have exceptionally large throat openings and no safety latches. They are designed this way to allow attachment around larger diameter objects.